Netflix has released the trailer for upcoming superhero drama The Defenders, which is set to premiere Friday, August 18th. Netflix has released a new trailer for upcoming superhero limited series The Defenders and in it, we see what happens when a quarter of heroes team up for a common cause. Developed for television by Douglas Petrie (Buffy the Vampire Slayer) and Marco Ramirez (Da Vinci’s Demons), The Defenders brings vigilante heroes Daredevil (Charlie Cox), Jessica Jones (Krysten Ritter), Luke Cage (Mike Colter), and Iron Fist (Finn Jones) together to fight against a singular enemy – The Hand, an order of evil mystical ninjas heavily involved in organized crime and mercenary activities. 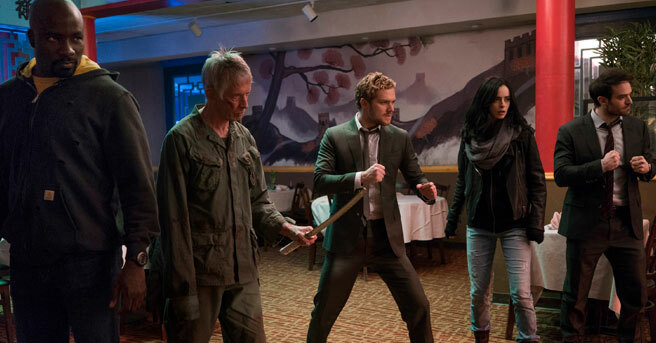 In addition to the team of heroes, The Defenders stars Elodie Young (Gods of Egypt) as Elektra Natchios, a weapon of The Hand who previously appeared on Daredevil, with guest appearances set for the likes of Sigourney Weaver (Alien) as Alexandra, head of an ancient organization; Simone Missick (Wayward Pines) as Harlem detective Misty Knight, who previously appeared on Luke Cage and will appear on the second season of Iron Fist; Eka Darville (Mr. Pip) as Malcolm Ducasse, Jessica’s assistant at Alias Investigations who previously appeared on Jessica Jones; and Jessica Henwick (Game of Thrones) as former Hand member Colleen Wing, who owns her own New York City dojo and previously appeared on Iron Fist. The Defenders is set to premiere Friday, August 18th on Netflix.